It does look simple, does it not? But your experience will reveal just how difficult it is, when you try to assign startup milestones and accountabilities. In my own startup, once when we had finally committed to the milestones, we agonized all over again about who was responsible for ensuring that the deadlines for projects were met? When we were starting out, we all seemed to be in some way responsible, so we struggled to fix accountabilities. Even in mundane housekeeping matters, we did not limit responsibility for photocopying. However, almost from day one, as sales start to roll and action happens in consequence, you will find out just how important it is to determine those startup milestones and accountabilities. So often you will be surprised when things don’t happen as you imagined or when they were supposed to. 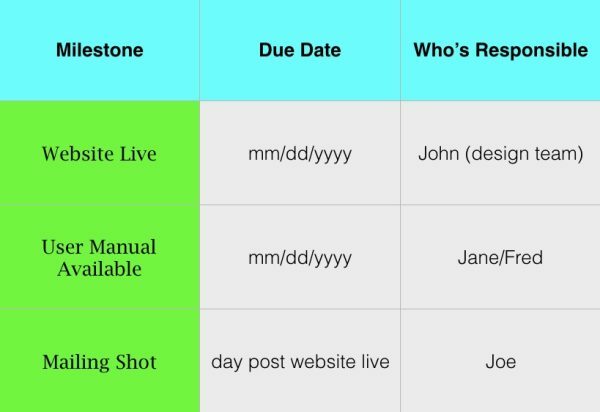 Often you’ll hear comments like, “but Jane never…” Therefore when setting time lines make sure that clear milestones are set and understood by all to whom the action is important. Above all, do not leave any doubt about who really carries the can for making something happen. As the main founder of the venture, I could not shirk full accountability for financial affairs and achieving the sales we needed to keep the cash flowing. Startup milestones and accountabilities are critical to creating culture. The venture’s founder is deeply responsible for setting the organizational culture. From day one she must make clear the roles and responsibilities of all of her colleagues. She sets the tone and will go on doing so as the business grows and complexity occurs. She will then be redetermining responsibilities as if they were startup milestones and accountabilities, all over again. It’s true that many tasks have more than one person responsible for them, either the whole or its parts. You will be amazed when you write these things down, how one or more aspect is open to doubt. If you put a milestones and accountabilities chart in front of a manager, she might not have realized that she had a responsibility to ensure than something actually happened. She might have assumed that another department or one of her subordinates carried ‘the can’. If several managers are in possession of a startup milestones and accountabilities chart for the same plan, there will be a collective desire and determination to see that the plan is carried out. Feedback to one another will greatly facilitate the plan’s achievement. This short article in the Harvard Business Review looks at the issues from a slightly different angle and will help you gain perspective on startup milestones and accountabilities. A tool that many planners have found very valuable is the Strategy Map that is a one page diagram of the venture’s strategy, enabling you to see the whole and the parts; other Venture Founders Tools will help, too: Key Performance Indicators, and Critical Success Factors.